The finest flourishes, the finishing touch, the perfect accent; whatever your dreams hold, Labl can bring them to life. From a simple blusher veil to the breathtaking presence of a royal veil, the style of veil can completely change the style of your wedding day silhouette. Bespoke veils made of the finest materials and unsurpassed craftsmanship of any style are the perfect complement to your gown. 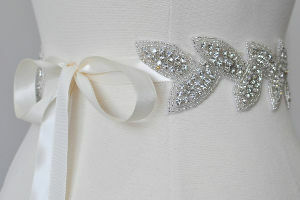 Sometimes it is a little pop of colour added by a custom sash or the sublime luxury of a beaded Swarowski crystal belt. Accentuating the waist of your gown could be the perfect way to add your unique style to your gown. Labl will design and make your waist piece to compliment perfectly, your perfect dress. 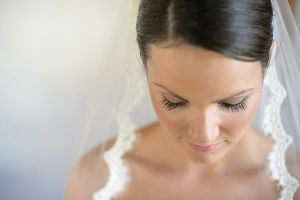 “The birdcage veil is daring, cutting edge, and definitely different. It requires its bride to be bold and confident. Timid, traditional brides need not apply.” If you think you such a bride, then Elizabeth will guide you through the choices and design the perfect compliment to your style. Where do you keep that little note from your future husband, that spritz of perfume before the perfect kiss? 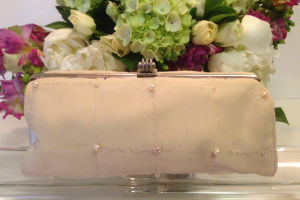 An elegant clutch, designed compliment your gown is a luxury no bride should do without. Made to exacting detail, adorned with the most luxurious of hand sewn pearls or crystals, your wedding day purse is a momento you can cherish forever. Labl Bridal is foremost a bespoke maison committed to to bringing your wedding dreams to life. Your ideas are the inspirations to our creations. Let our expertise and love to create help you realize the perfect accessories for your wedding attire. Garment Bags are made from 100% Cotton. Designed to our superior standards, they are the purposed to safeguard your clothes against the elements such as dust, insects and mould, all year round. Ideal for home, storage and or travel purposes. Breathable. Acid-Free. Lightweight. Hygienic.